I like visiting my garden. I visit in the early morning as the sun is just peeking over the horizon. I visit when it's raining, a gentle patter or a downpour. I visit when it's so hot I can feel sweat trickling down my back. I visit to pull weeds. I visit to water. I visit to pollinate. I visit to harvest. I visit to look--to see what's changed. I visit to be amazed. I visit just to be. I like visiting my garden. Things grow there. I've been doing this thing lately. Each day I've been posting on Facebook something for which I am thankful--sometimes more than one something. It's part gratitude journal, part my desire to put some positiveness out into the world, part reminder to myself to be on the lookout for reasons to be grateful. These thankful things have been simple and profound, routine and novel, things we take for granted and things unexpected. Yesterday, I didn't post. I couldn't post. I am thankful. Of course I am. I have so much more than I need; I am blessed beyond measure. But I am also weary. So tired. Worn away by the grit of disappointment and the grind of the every day. 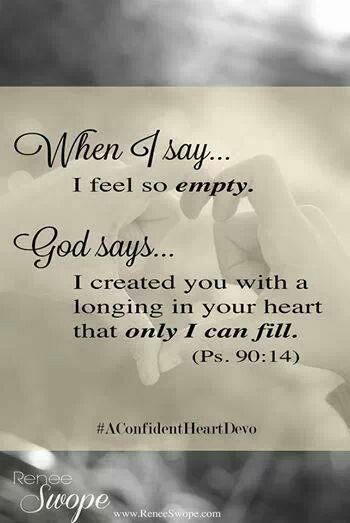 I feel empty, poured out. It doesn't feel like I can give or do anything more. And yet. God is good. Always. So today, I am thankful. Just thankful. Because I can be nothing else. I thought it was probably time for a garden update. Things are growing. I seriously love this picture. Isn't that such a pretty color? These are some of my San Marzano tomatoes. I planted mostly plum tomatoes this year because they're better for canning. The tomato plants are huge! Like, if they had better support, I think they'd get taller than me. It's looking good for being able to can lots of tomatoes this year. Remember when I said I hoped the beans and lettuce would be done producing before the squashes and melons took over the bed? Um, well, didn't quite happen... The beans are almost done, that's true. And I realized I don't know how to tell when the lettuce is done. It still tastes bitter to me. Or maybe it was bitter, and then sweet, and now it's bitter again, and I missed my window. In any case, the pie pumpkins and spaghetti squash vines are going everywhere. I've managed to keep them away from the beans and lettuce thus far, but pretty soon they'll be out of control. I picked some lettuce this morning, and I'm taking it over to the chickens this afternoon. The green beans are going in the freezer today. One of the reasons why square foot gardening works is because plants are encouraged to grow up instead of out and over the ground. Anything that vines or climbs is grown on a trellis or frame of some sort. Here are some of the spaghetti squash vines. I'm hoping next year, the boys will make something like this for my squashes and beans to grow up. Here's one of my pie pumpkins. Yes, hubby carpeted the area surrounding the garden for me. Because he loves me. Also it makes weed suppression simple. And a spaghetti squash. 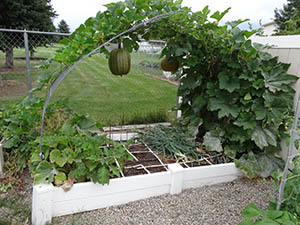 The squashes that are growing above the ground will need to be supported as they get bigger. The sugar snap peas are done, and we've been eating grape tomatoes as they ripen. We haven't seen much from the cucumbers pickles or melons yet, but they're coming. We had to plant so late that we might not actually get fruit this year. The zucchini is just getting started. I think the tomatoes are kind of crowding it/shading it a bit. The carrots are growing. Nowhere near big enough to harvest yet, though. I'm pleased with the garden this year. It's so satisfying to plant something with my own two hands, and have it grow into something beautiful and nourishing. I will plant pole beans rather than bush beans. I'm still hoping to someday get enough beans ripe at the same time to justify canning them, and I've heard that pole beans produce more per plant. In the same vein, I will plant vining cucumbers pickles rather than the bush variety--I realized after I planted them that these pickle seeds are a bush variety. That is, if Bubby still wants me to plant pickles next year. I will put the tomatoes in the back of the bed. 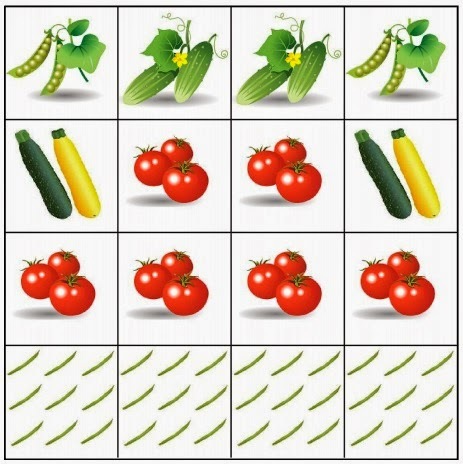 I will have a better trellis system for the squashes, cucumbers, and beans. I'm hoping to grow broccoli and/or Brussels sprouts next year. My sister's success with broccoli this year is inspiring. I'm hoping to plant a third 4x4 foot bed with strawberries. And then there's this beauty. We may not be able to keep fish alive in our pond (they either die within days or mysteriously disappear, possibly eaten by squirrels), but we can grow flowers. What's growing for you these days? I'm taking care of chickens again this week. Different friends, different chickens. And more eggs! They've been getting 18-20 eggs daily. We are not going to be able to use 18-20 eggs every day, but that doesn't mean I'm not going to make a valiant effort. As for the extras, if you happen to be local to me, and you'd like some, I'm selling eggs on behalf of the chickens' owners for $3 per dozen. Because of the bird flu epidemic, and the subsequent mass chicken slaughter, that's about what our local grocery stores are charging for their poor shadow imitations right now. 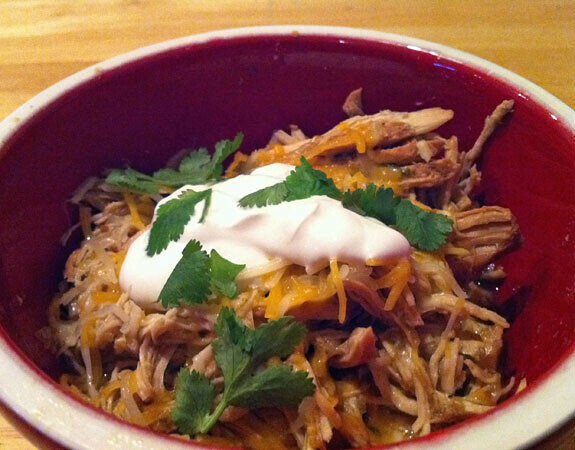 If you've never had fresh from the homestead eggs, you should give them a try! They are so yummy, and they're more nutritious, too, not to mention happier. Yes, the eggs are happier, because their mamas get to roam free and eat bugs and stuff. I'm also going to freeze some of the eggs. Did you know that you can freeze eggs? Well, of course you know that--you can freeze anything. But did you know that you can freeze eggs and the frozen, then thawed, eggs actually maintain integrity? Yes, indeed you can, and they do. I've been freezing egg whites in ice cube trays for a while now, but with the expected influx of eggs this week, I will be freezing whole eggs in a muffin tin. You probably won't be able to fix them sunny-side up after they've been frozen (since you're supposed to break the yolk), but I eat most of my eggs scrambled or in baked goods, so I'll be all set. Click here for egg freezing instructions. I'm not going to do a menu plan this week. I'm just going to eat eggs. Maybe some veggies. And bake things. With eggs. Let me know if you want eggs. It's AKD's birthday today. He's 15. Fifteen! I blinked and now...look at him! Practically grown. He loves it when I post pictures of him chewing. 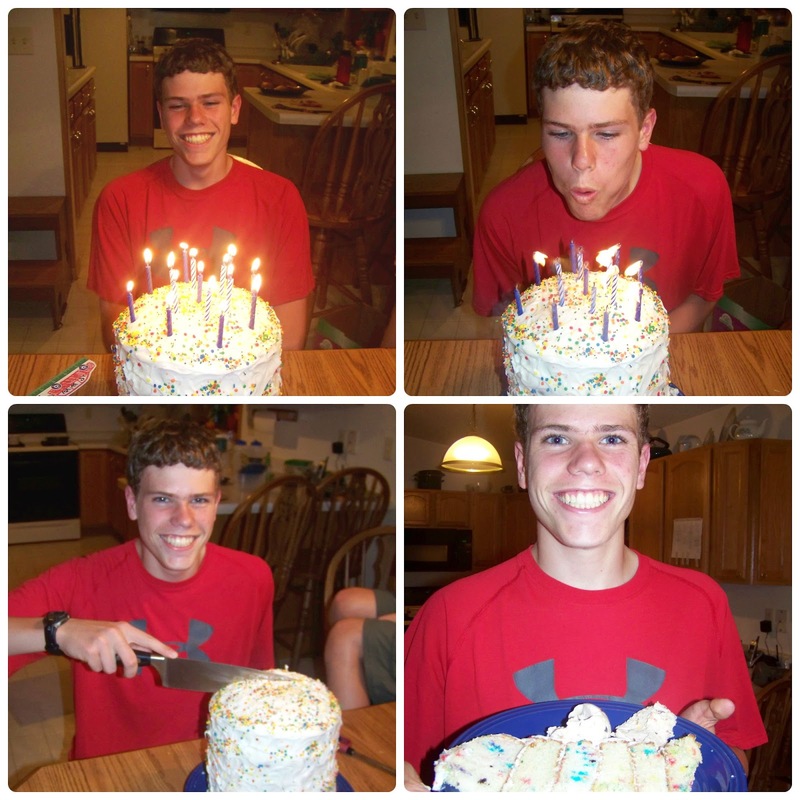 Even more than he loves me shoving a cake at him and insisting that he smile for the camera minutes after he wakes. He said he wanted to give me a break from elaborate cake-making, so AKD requested a simple funfetti cake for his birthday. Simple, but huge. That sucker is 12 inches top to bottom. Six layers. 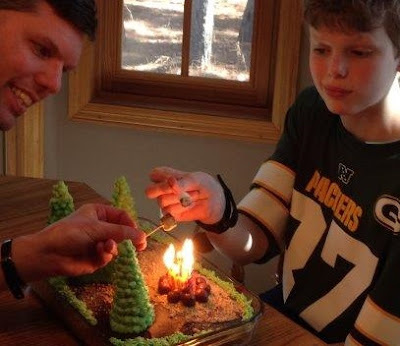 I have to say, this is a nice change from the usual waterfall cake, but I do enjoy making elaborate cakes for my kids, so he needn't have worried. And this one was challenging in its own way. By the way, it is really fun to throw sprinkles at the side of a cake. Fun, but messy. Due to various factors, we decided to make the cake a week early. Good thing, too, 'cause a week later, we still have some of this cake hanging around. I told my sis that we were making and eating the cake early, and she mentioned that I could just wait and post a picture on Facebook on his actual birthday and no one would even know we hadn't eaten the cake on his actual birthday. And that's true. I could have, and no one would have. But I didn't. First, I really don't care whether or not y'all know we ate the cake early. Really, who cares? And if it offends or bothers you that AKD didn't get to eat his cake on his actual birthday, let me assure you that he will eat cake today. You don't need to worry about that. And second, it makes me wonder if my sis has done something similar in the past. Not that I care. I'm sure she had a good reason. Or not. Does not matter to me either way. But the exchange was such a good reminder to me that what we see on Facebook or Instagram, or even on this blog, is not necessarily the truth. In fact, it is never the whole truth. We share what we choose to share, and most of us choose to share the good stuff. It is a sure recipe for discontentment to compare the nitty-gritty every day of our own lives to the shining moments we see on social media. How dangerous it is to hold up the intimate knowledge of our imperfections against the outside packaging of others. Also dangerous? A 12 inch high cake. Happy birthday, AKD! 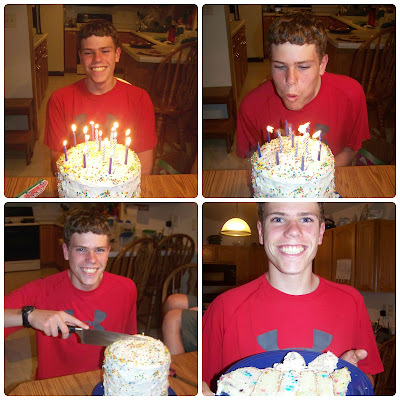 Tomorrow is my oldest son's birthday. You know what this means, right? 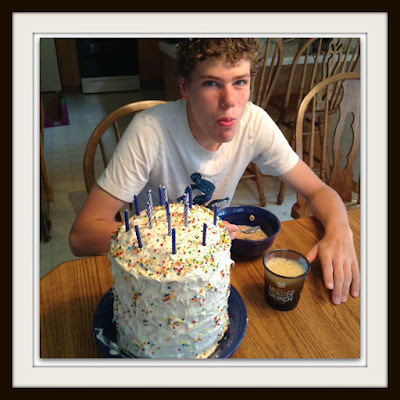 Yes, indeedy, this means it's time to post the pictures of my middlest son's birthday cake. You know, the cake we ate and the birthday we celebrated in April? Yeah, that one. This is what you call a last chance, here. 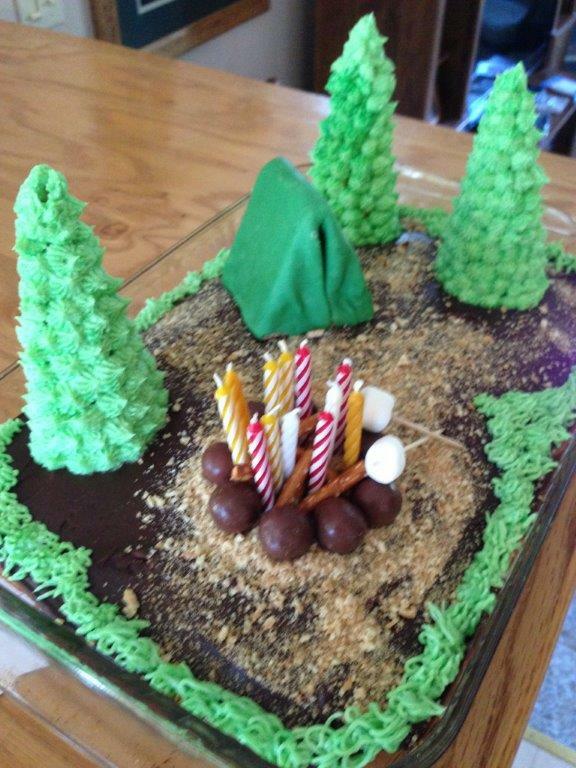 For his 12th birthday, MC requested a camping cake. I have a strong suspicion that the request was a direct result of this incident with a Cub Scout cake and its inedible decorations. Cute, huh? 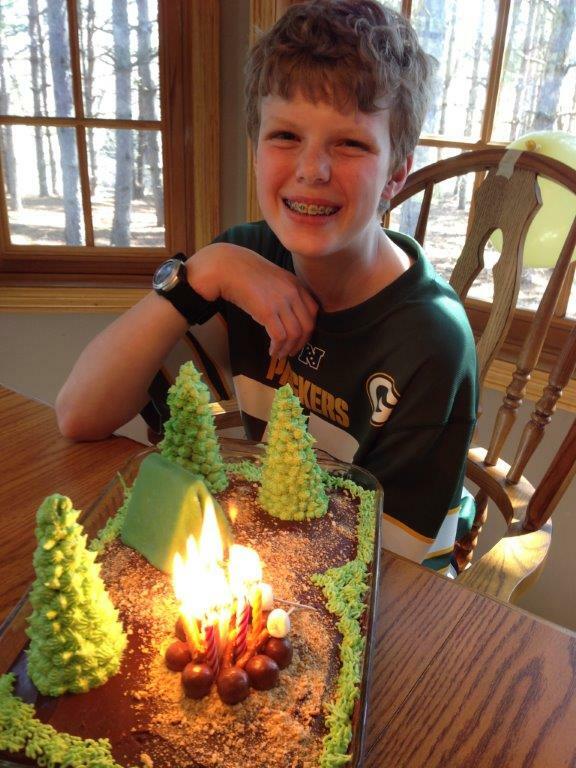 And, most importantly to the birthday boy, all edible (except the candles and marshmallow sticks). The trees are sugar cones frosted with a star tip. The tent is a couple of graham cracker halves covered in modeling chocolate. The fire ring is made of whoppers candies, and the logs are pretzel sticks. The dirt is chocolate frosting along with graham cracker crumbs. I used my grass tip along the edges of the cake. 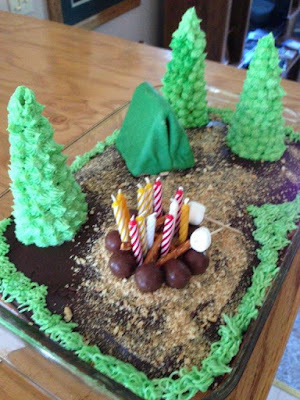 I did make a trunk for one of the trees by putting it on a pretzel rod stuck into the cake, but the 9x13" single layer cake was not thick enough to hold up the weight of the pretzel and frosting-laden cone, so I had to put all the trees on the ground. I suggest an at least 2 layer cake if you're wanting your trees to be off the ground. 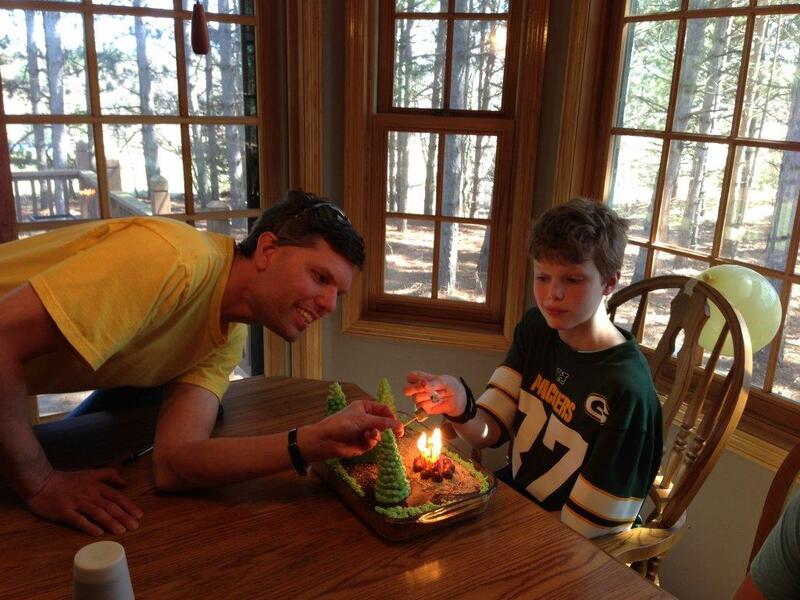 When we lit the 12 candles, it was a blazing inferno of a campfire. Much higher than a scale Boy Scout's knees would have been. Whoops. So, of course, the birthday boy and his goofy Daddy did the only sensible thing. Hey, y'all. Did you miss me last week? No? Well that's ok. Out of sight, out of mind and all that. Well, despite the fact that summer break is half over, our swimming pool is finally open, and it's been hot and humid, I still feel as if our summer hasn't really begun. Crazy. And busy. That's how the past couple of months have been. Most of it has been planned, and almost all of it has been good, but I'm longing for a little bit of down time. Looking at our calendar for the next couple of months, I don't think that's going to happen any time soon. And that's ok. It's just the season I'm in right now. Busy, instead of summer. I've spent pretty much all of my time since school let out either packing, traveling, unpacking, or preparing to travel again, and non-stop busy-ness is just not something I enjoy, so I've been feeling a little stressed, out of sorts, cranky. And, truth be told, I've also been feeling a little disappointed. This isn't quite how I expected my summer to be, and that grieves me. I love Lysa TerKeurst, don't you? Here's what she said about this image: "though life doesn’t always fit nicely into a neat little schedule, all the things I have to do are evidence of blessings. If I’d just look at life a little more from this perspective, everything would seem so much sweeter." All the things I have to do are evidence of blessings. So true. So easy to forget. Well, it's July. Everyone is home, and will be home for the next...five days? Tell me. Is your summer as crazy busy as ours has been? It's all good, but wowsers. We are on the go. I'm feeling a bit nostalgic for those lazy days of summer. Do they even exist? I started this post on May 25. That's more than a month ago. I was going to tell you what I planted in my garden and how it still, after all these years of planting gardens, requires a lot of faith to put those seeds into the ground. But now? It feels too late. I mean, it's never too late to talk about faith, but you see, those seeds have sprouted and grown and now I've got bona fide veggies in my garden. We've even been harvesting eating-straight-off-the-vine sugar snap peas for over a week now. I planted the rest of my garden last week. I put some seeds in the ground a couple of weeks ago, but held off on the plants because of low temps. Finally last week, the forecast lows were far enough away from freezing for the entire 10 day outlook that I felt OK putting the plants out there. And then it rained. Isn't that perfect? My garden has moved this year, to a more sunny location. I am so happy about this. Hubby, who agreed to make the garden for me, expected me to want a huge plot. But honestly, even though there is no reason to believe my garden will do poorly again this year, I couldn't stand the disappointment if we put a whole lot of effort into it and it still underproduced. So I went small this year. To see if it'll work the way I hope it will. Which is not to say I didn't plant a lot. 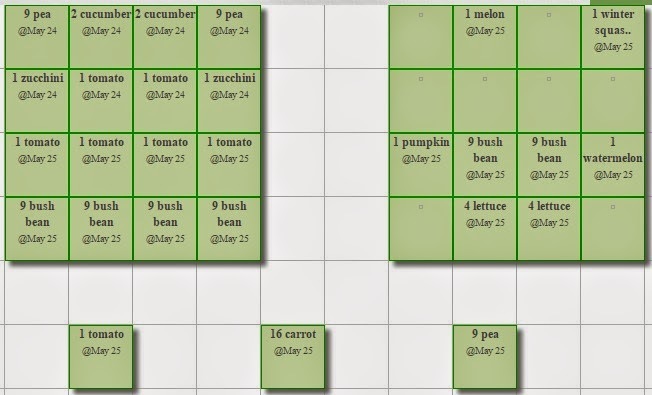 I'm using Mel Bartholomew's square foot gardening method, which is a "revolutionary way to grow more in less space." We'll see, Mr. Bartholomew. Anyway, I have two 4x4 foot beds, and 3 pots. That's it. 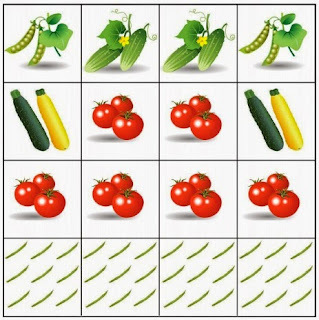 In one plot, I have 2 squares of sugar snap peas, 2 zucchini, 6 tomatoes (mostly roma, because they're better for canning), 4 green beans, and 2 squares of pickles. Bubby wanted me to grow pickles, so I am. In the other plot, I have spaghetti squash, honeydew melon, watermelon, pie pumpkins, 1 square of lettuce, with another to be planted in a couple of weeks, and 2 more squares of green beans. I'm hoping the lettuce and green beans will be done producing before the squashes and melons take over the space. In my pots, I have a grape tomato (Hubby and AKD like to grab these as they're passing on the riding mower), sugar snap peas plus lemon cucumbers, and carrots. Already, the peas and beans are up. It's so thrilling to see their little green heads bending up toward the sun. By now you know how I feel about gardening. It is nothing short of miraculous to be able to produce life from dried and shriveled and dead-looking seeds. It takes tremendous faith to plant a garden, and seeing the evidence of life gives me hope. 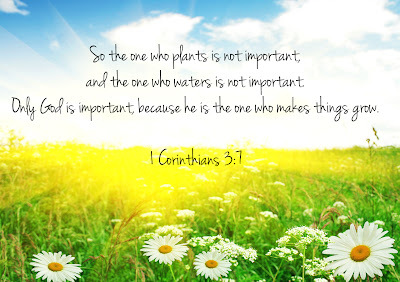 It gets easier every year, but planting a garden remains an act of faith for me. It makes me wonder what other areas in my life I need to practice faith? What dried up, dead-looking corners of my being can bring forth new life if nurtured and cared for?